Remove from play 1 "Assault Mode Activate" from your Graveyard. 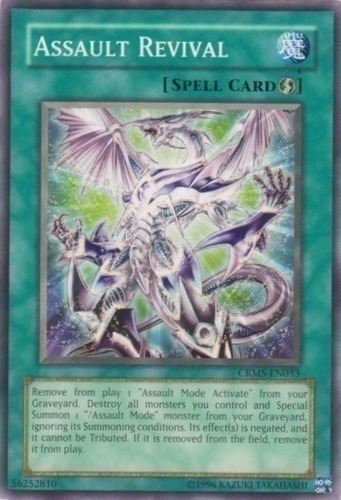 Destroy all monsters you control and Special Summon 1 "/Assault Mode" monster from your Graveyard, ignoring its Summoning conditions. Its effect(s) is negated, and it cannot be Tributed. If it is removed from the field, remove it from play.